We describe a case of anhidrotic ectodermal dysplasia (AED) with an autosomal recessive mode of inheritance, a very rare entity, in a 2-year-old female child of two asymptomatic, consanguineous parents. Their previous child also had a similar condition. 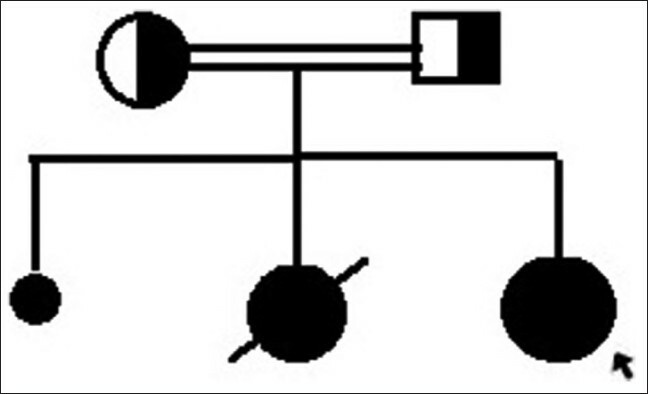 Autosomal recessive AED (AR-AED) can have its full expression both in males and females and it is clinically indistinguishable from the x-linked recessive AED (XL-AED), which is the most common type of ectodermal dysplasia. Unlike the partially symptomatic carriers of XL-AED, the heterozygotes of AR-AED are phenotypically asymptomatic. Most cases of anhidrotic ectodermal dysplasia are X-linked recessive type, accounting for 80% of cases. However there is a rare autosomal recessive variant of anhidrotic ectodermal dysplasia which can be clinically indistinguishable from XL-AED. A 2-year-old female child, third of the sibship, born out of second degree consanguinity (parents are first cousins), by a normal vaginal delivery at term without any complications, presented to us with complaints of sparse scalp hair growth with absent body hair, eyebrows, and eyelashes and delayed dentition. Mother reports absence of sweating in her child with history of recurrent pyrexia since neonatal age. Her psychomotor development was normal. There was no family history of similar symptoms, except that her previous female sibling had same complaints with a dysmorphic appearance, whose neonatal period was complicated with recurrent fever and chest infection leading to her death at 6 m of age. The parents' first pregnancy resulted in an abortion at 2 months, due to an unknown cause. Cutaneous examination revealed a normal-looking smooth skin with normal palmoplantar skin and dermatoglyphics. The child had a typical old-man appearance with finely wrinkled periorbital skin, everted lower lip and low-lying ears. Scalp hair was sparse, light colored, thin with complete absence of eyelashes and eyebrows and body hair. Oral examination showed eruption of only two conical, wide spaced maxillary teeth and a low-arched, flat palate [Figure 1]a and b. There were no nail abnormalities. Systemic examination was unremarkable with no evidence of mental retardation. 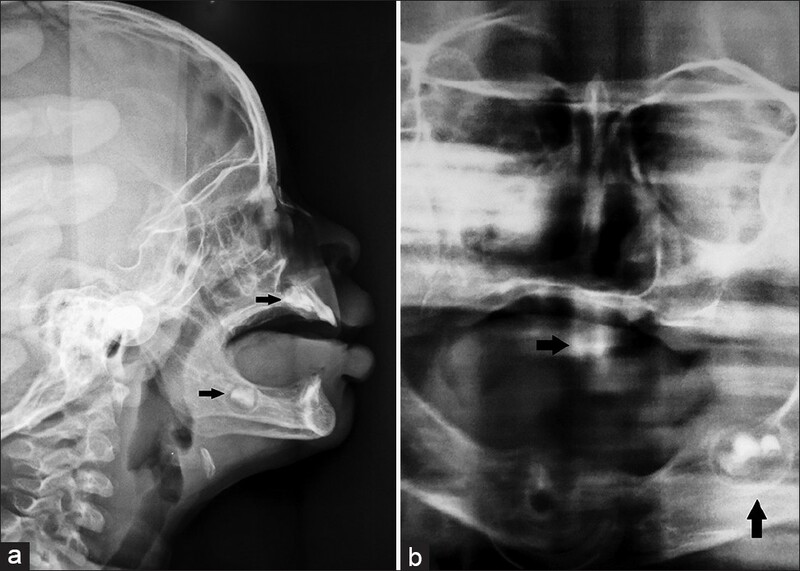 Orthopantomogram and lateral view of mandible showed oligodontia with only two maxillary teeth and a left mandibular tooth bud [Figure 2]a and b. Biochemical investigations revealed no abnormalities. Histopathology of palmer skin from hypothenar area showed inconspicuous sweat glands. Genetic study was not done due to resource-limited set up. Parents were determined to be unaffected after careful physical examination [Figure 3]. 1. Clarke A, Phillips DI, Brown R, Harper PS. Clinical aspects of X-linked hypohidrotic ectodermal dysplasia. Arch Dis Child 1987;62:989-96. 2. Freire-Maia N. Ectodermal dysplasias. HumHered 1971;21:309-12. 3. Kabbaj K, Baala L, Chhoul H, Sefiani A. Autosomal recessive anhidrotic ectodermal dysplasia in a large Moroccan family.J Med Genet 1998;35:1043-4. 4. Turleau C, Niaudet P, Cabanis MO, Plessis G, Cau D, de Grouchy J. X-linked hypohidrotic ectodermal dysplasia and t (X; 12) in a female. Clin Genet 1989;35:462-6. 5. Baala L, HadjRabia S, Zlotogora J, Kabbaj K, Chhoul H, Munnich A, et al. Both recessive and dominant forms of anhidrotic/hypohidrotic ectodermal dysplasia map to chromosome 2q11-q13. Am J Hum Genet 1999;64:651-3. 6. Munoz F, Lestringant G, Sybert V, Frydman M, Alswaini A, Frossard PM, et al. Definitive evidence for an autosomal recessive form of hypohidrotic ectodermal dysplasia clinically indistinguishable from the more common X-linked disorder. Am J Hum Genet 1997;61:94-100. 7. Beahrs JO, Lillington GA, Rosan RC, Russin L, Lindgren JA, Rowley PT. Anhidrotic ectodermal dysplasia: predisposition to bronchial disease. Ann Intern Med 1971;74:92-6. 8. Ventruto V. A simplified method for observing and recording dermatoglyphics patterns, including counting of sweat pores. Clin Genet 1986;30:525-7. 9. Bergendal B, Koch G, Kurol J, Wänndahl G. Consensus conference on ectodermal dysplasia with special reference to dental treatment. Jönköping, Sweden: The Institute for Postgraduate Dental Education; 1998. In AR-AED, both male and female can be severely affected and the heterozygotes of AR-AED are phenotypically asymptomatic in contrast with the carriers of XL-AED who can have partial expression of the syndrome.